Unnat Bharat Abhiyan is an initiative of the Ministry of Human Resource Development. It was coordinated and steered by IIT Delhi. UBA was launched in Oct 2014, in order to uplift rural India. This programme was launched in collaboration with the Indian Institutes of Technology (IIT) and the National Institutes of Technology (NITs) across the country. Each IIT will identify 10 villages in its neighborhood and work out technologies to solve the most pressing issues of the region. Different teams from these institutes visited the villages, identified problems and then aim to find financially-viable schemes. Unnat Bharat Abhiyan is flagship programme of Ministry of Human Resource Development (HRD) that aims to enrich Rural India. 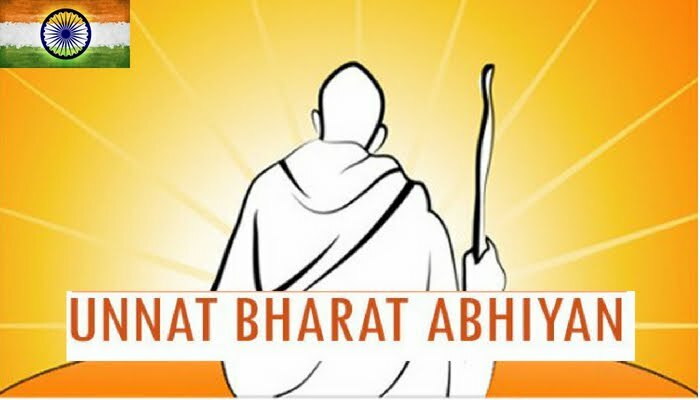 The second edition (Unnat Bharat Abhiyan 2.0) was launched in April, 2018. Currently 748 institutions are participating under the scheme. In phase II, 605 institutions were selected. Out of these 313 are technical Institutions and 292 are Non-Technical Institutions. The scheme aims to link higher education institutions with set of at least five villages, so that they can contribute to economic and social betterment of these village communities using their knowledge base. Under this scheme, higher education institutions will participate in development activities, particularly in rural areas. To engage faculty and students of higher educational institutions in understanding rural realities. Identify and select existing innovative technologies, enable customization of technologies or devise implementation methods for innovative solutions as required by people. The scheme is inspired by vision of transformational change in rural development processes by leveraging knowledge base and resources of premier Institutions of the country to help build the architecture of Inclusive India. It also aims to create virtuous cycle between society and inclusive university system, with latter providing knowledge base, best practices for emerging livelihoods and upgrade capabilities of both public and private sectors. Under it, institutes through their faculty and students, will carry out studies of living conditions in adopted villages, assess local problems and needs, workout possibilities of leveraging technological interventions and need to improve processes in implementation of various government schemes, prepare workable action plans for the selected villages. 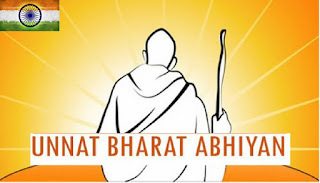 1.What is Unnat Bharat Abhiyan? Unnat Bharat Abhiyan (UBA) is national mission for rural upliftment which is inspired by the vision of transformational change in rural development processes. 2. Why was Unnat Bharat Abhiyan mission launched in India? In India, 70 % of the population lives in rural areas engaged in agrarian economy. 51% of the total workforce is employed in agriculture and allied sectors which accounts for only 17 % of the GDP. Moreover, there are huge disconnects such as inequity in health, education, incomes and availability of public services and assets. Hence the UBA mission was launched with the understanding that without rural development, India cannot optimally achieve its growth potential and claim its place in the world. 3. When was the UBA mission launched and by whom? Unnat Bharat Abhiyan is a mission initiative of the Ministry of Human Resource Development conceived on November 11, 2014 and it is coordinated by the IIT, Delhi. Now, HRD had launched phase 2 in April, 2018. 4. What are the objectives of the UBA mission? Providing rural India with the professional resource support from Institutes of higher education, especially those excelling academically in the field of science, engineering, technology and management. 5. What is the duration of each project under UBA mission? The duration of each UBA mission project shall be of 2 years. 6. What are the benefits of the UBA mission for rural India? Under the UBA mission, professional institutions will identify pressing problems and development needs in villages. These development challenges will be addressed through the use of appropriate technology and financially viable solutions will be developed for accelerating sustainable growth in villages.